I decided to give myself some snowflake nails leading up to the big day next week, it's my works night out tomorrow and as i'm wearing this dress i thought they'd fit in pretty well too. I'm a big fan of decals/stickers, my all time favourite ones are the Chanel ones i did a few months ago but these certainly come a close second. I'll be doing some other nails at the weekend with these and i'm so freaking excited! So pretty! I bought snowflake stickers a couple of weeks ago to do the same thing! These are so pretty and festive and will look great with your dress! Oh I loveeeee your nails, definitely have to give this a go for Christmas!! 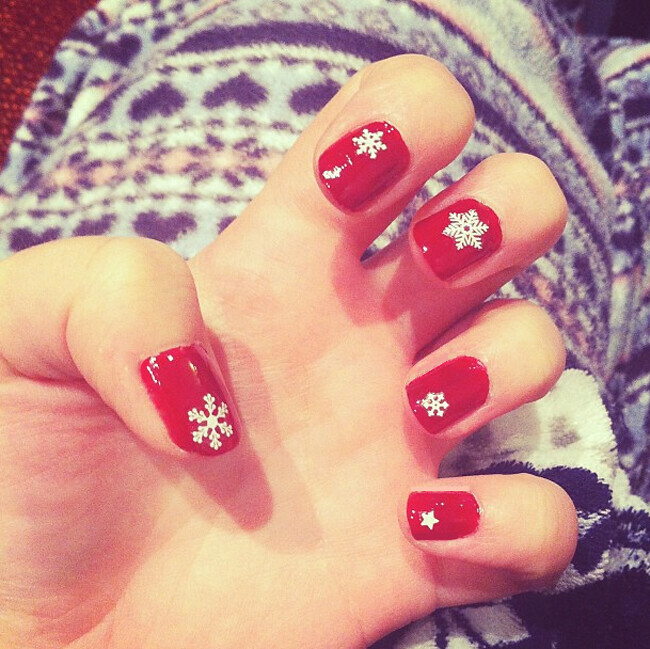 These look really lovely and festive, plus they look great on the contrasting red polish! Really simple as well, I love it when I come across non tacky Christmas nail art. Although you do have to a love a bit of tack every now and again!